I have finally got the main room looking the way I want it, more especially having my Stampin' Up! cards & projects on display but not taking up half the room. 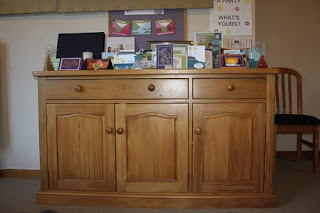 This sideboard used to be in the lounge until we had the big change around of furniture. I have always wanted the sideboard where it is now but I'm not sure why we didn't have it there originally. My guess is that as the kids grew things that are in it are now no longer ripe for the picking & it is "safe" to have it in the main room. It also makes sense to have it in the main room, where our dining table is, because the drawers hold the good cutlery, the placemats & the cupboards hold the good dining set.